Happy Monday! It’s time for another Cards in Envy challenge. This week our theme is “Typography.” These are cards using letters, words, or sentiments as your focal image. For today’s card, I used Ellen Hutson’s “Holly Jolly” stamp set for my “typography” element. The design paper is Fancy Pants “Wish Season” by Kim Watson. I stamped the snow bursts in Simon Say Stamp white pigment ink and topped them with Nuvo Crystal Drops. My flag dies are My Favorite Things and I finished off the card with some black Distress Ink. 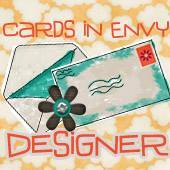 Hope we’ll see your “Typography” cards over at the Cards in Envy challenge. You have until November 19th to enter. I’m here today making beautiful music using the new “Torn Music Collage” stamp using Hero Arts “Wet Cement” repeatedly with the MISTI over woodgrain design paper until I got the depth I wanted. 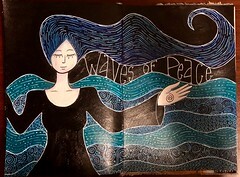 I then covered the entire piece with Art Anthology “Dazzle” to create a sparkly background. My sentiment, “Stay Humble” was stamped on the same design paper and embellished with stitching dies. We hope you are enjoying the November Release hop. Until then, please join us at the Facebook group. Technique Junkies November Blog Hop! Is it November already? Unbelievable! Have you been enjoying the annual Technique Junkies 30 Days of Christmas? I sure have. 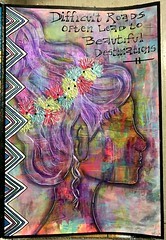 If you need some inspiration, pop on over to the T.J. Pinterest page or check out the Technique Junkie Design Team’s site. Pat is offering a discount of 20% on all holiday stamps. For today though, the Technique Junkies Design Team is showing off the new releases for November. As usual, Pat has come up with some great new stamps for this release and I know you are going to love them. Pat is offering 15% off all November Release Stamps for one week! WooHoo! Supplies: Fine Gold Thread, Dylusions, Stampendous Embossing Powder, Love Nicole “Thanks” Die, My Favorite Things Feather Die, Art Anthology “Sunshine” Sorbet, Simon Says Stamp Cardbase Die. Technique: White heat emboss over black cardstock. Now, that I’ve shown you what I have to offer, I don’t want you to miss any of the other design teams creativity so I encourage you to start hopping at the Technique Junkies Design Team Blog. If you are arriving from Lanette’s Blog, you’re in the right place! Great projects Lanette! The next stop is over at Jeanne’s Blog. I sure hope you enjoy the Technique Junkies November Release Hop! Don’t forget – 15% off November Stamps for the next week only and 20% off the Christmas stamps until November 15th! 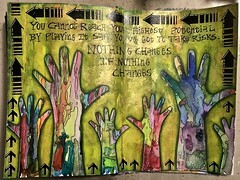 The Crafty Nurse here with some inspiration to spark your creative flow. Have you joined our monthly challenge? If not, we’d love to see your entries for prizes and you just may learn a new technique at the same time. You can find the challenge over on the sidebar of the Technique Junkies Blog. Now let’s get on to the inspiration. Can you tell I love this background stamp? It’s got a vintage feel to me. This card uses a Distress paint resist technique that’s as easy as stamping with paint, drying and applying ink over the top to colorize. 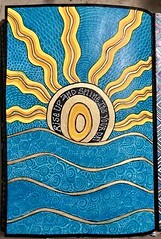 I also added Art Anthology “Dazzle” which is a great to add some pizazz and seals in any water-soluble inks. 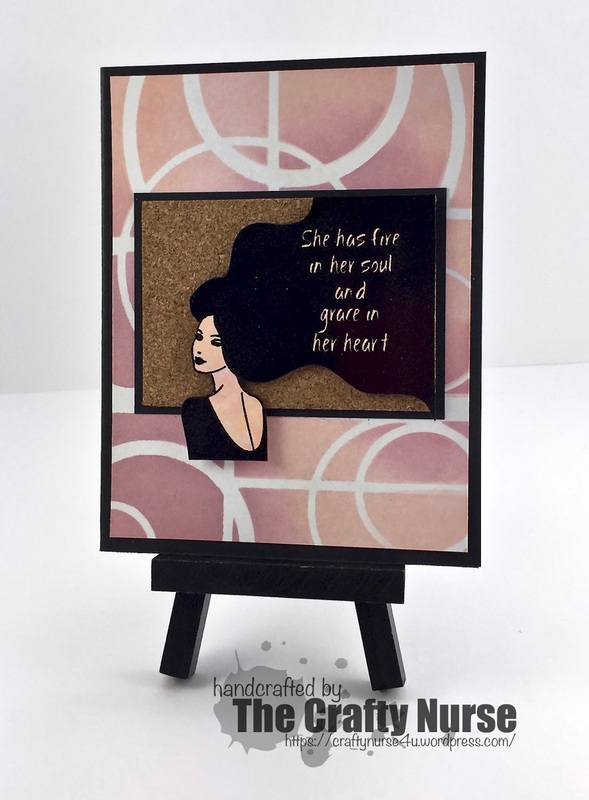 The Crafty Nurse here with some mid-week inspiration using the lovely October release stamp, “Grace in Her Heart”. 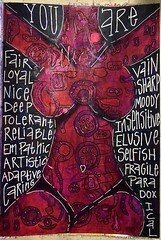 I stamped her on cardstock I colored with Copic markers and popped her up over cork. My background is the irResistable Stencils Tutorial from Artistic Effects CD. We’d love to see your cards and projects over at the Facebook Group and in our Design Team challenge where you can win prizes for your entries! Hello Junkies! I’m here today with a Technique Junkies October release stamp called “Grace in Her Heart #SD819”. I began my background using Distress Paints adapting the Distress Stain Dip Technique from Artistic Effects CD. I then ran it through an embossing folder for texture. My stamp is on kraft cardstock using Versfine Black Onyx ink. I hope you find some time to get crafty today. We are all over at the Technique Junkies Facebook Page so if you haven’t stopped by, we’d love to see you! We also look forward to your entries in our monthly challenge over at the Design Team Blog. Happy Monday! It’s time for another Cards in Envy challenge. Our theme is “Let’s Play Dress Up” which means you can enter any card featuring Halloween Costumes. The Cards in Envy challenge asks that your cards fit into a standard A2 envelope for ease of mailing, but that doesn’t mean they have to be one layer or clean and simple. You have until November 5th, to enter. My card today features a digital image by Tiddly Inks which I colored with Copic Markers. The purple features RV99, V17, V15 & V12. The Hair is a unique combination is W9, R59, R56 and E97, a combination I learned from Alyce over at Kit & Clowder in her monthly coloring classes. We look forward to your “Let’s Play Dress Up cards over at Cards in Envy! The Crafty Nurse here with some holiday spirit. I love to get my Christmas cards done early so I don’t have to rush around in December when I need them. I’ve used some new and old Technique Junkies stamps to create this vintage style card. Supplies: MISTI, A Colorful Life’s “Square Fade Stencil,” Distress Paint in Frayed Burlap, Distress ink in Antique Linen, Gold Foiling, Holographic EP, Versamark, WPlus9 Die, Neenah Cardstock, gold cardstock, flitter-glu, and gold flakes. Directions: Stamp Arabesque using Distress paint on cardstock using MISTI, ink with Distress, DRY completely with heat tool, apply versmark through stencil, apply holographic EP and heat, stamp sentiment using MISTI (a must because of texture), cut card panel using circle die, pop-up center die, stamp snowflake with flitter-glu, foil, buff, and back with gold cardstock. 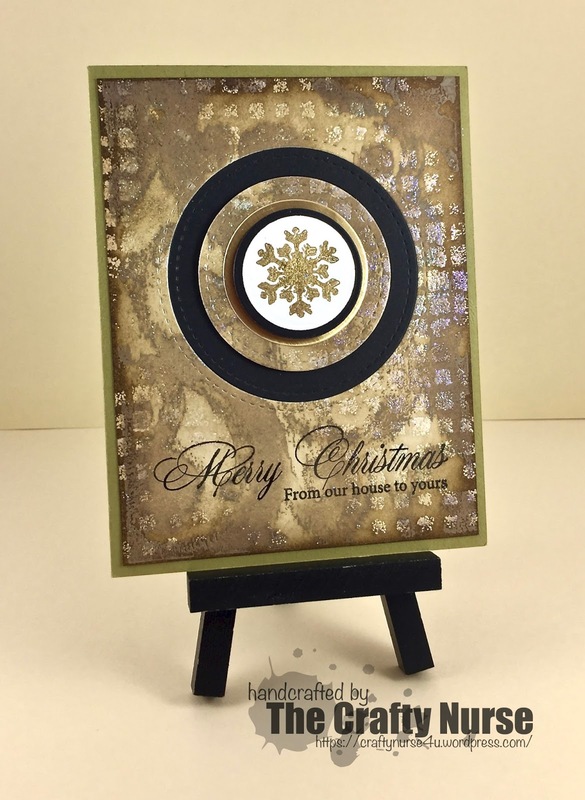 The Crafty Nurse here with another holiday card using a gorgeous background stamp from the October release. Today’s the last day to grab new releases for 15% off. Technique: Distressed Paint Resist – Stamp using pearl paint, dry, apply distress inks, buff. 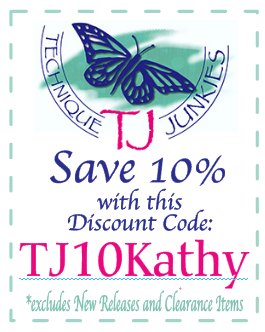 Please enjoy 10% off at the Technique Junkies store using TJ10Kathy. Please join us over at the Technique Junkies Facebook Group to share your work. 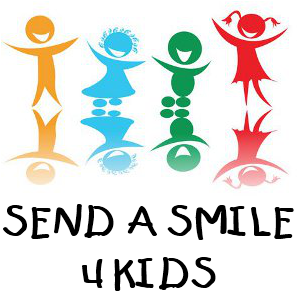 Don’t forget about the monthly challenge for a chance to win a $25.00 gift certificate. Hey there Junkies! The Crafty Nurse here today using “Scientific Computations #S705” from the October Technique Junkies release in honor of my youngest son’s birthday. Happy Birthday, Matt!! You still have a few days to pick up a 15% discount on the new releases. In the meantime, I hope you are enjoying the Design Team Hop. It’s a treat! I love this stamp. Matt is a math wizard and it’s perfect to encourage him while he’s busy at college. We hope to see you in the Facebook group. Please also use the TJ10Kathy discount code over at the Technique Junkies store! As part of the October Blog Hop, Pat is offering a 15% discount on all the new October Release Stamps.